As part of a major planned refurbishment and overhaul of a major food processing plant in the South of England, we were appointed Principal Contractor for the structural repairs to one of the buildings. The works, to both internal and external elements, involved grit blasting to remove finishes, traditional concrete repairs, the application of fairing coats and anticarbonation coatings. 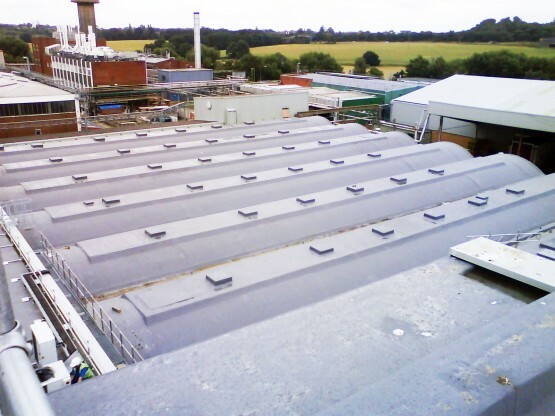 With our proven experience in the application of liquid applied roof membranes together with the success of the structural repair contract, we were able to negotiate a subcontract for roof works with the Principal Contractor responsible for the internal refurbishment of another building. As part of the upgrade to one of the food production buildings, the large barrel roof required weatherproofing as the existing covering had shown signs of wear. A single part cold applied liquid membrane manufactured by Sika LPL was specified with a requirement for a 15-year insurance backed guarantee. Access and edge protection were provided by utilising the scaffold erected by the Principal Contractor for their cladding and M & E modifications which included isolation or diversion of air intake vents on the roof. The existing coverings, consisting of felt, aluminium coated asphalt and plain concrete, were cleaned by water jetting and any remaining vegetation or growth treated with Biowash prior to a final wash. Any damaged areas were repaired with a polymer modified repair mortar. Primers appropriate to the various roof substrates were applied followed by a coat of Decothane SP which is air curing single part cold applied polyurethane liquid. Whilst still wet, Reemat GFM, a glass fibre matting, was embedded into the SP coating until saturated, using rollers and brushes providing additional strength and durability to the system. A final coat of SP in steel grey, together the PU sealant to the edges and termination points of the system, were applied to complete the new membrane. The developed area was approximately 7,500m² with in excess of 15,000 litres of Decothane being applied and has been one of the largest barrel roofs in this country to be treated in this way.